Oh my ULTIMATE favorite would be Mexican / Tex Mex. I can only assume it comes from my living in Arizona for my formative years! During BOTH pregnancies it was all I craved. Keith indulged me by making fajitas practically every night in the first trimester with Tristan! One of my favorite recipes would be my Pumpkin Tortilla Soup! Most of our go-to dinner’s are along that cuisine theme. 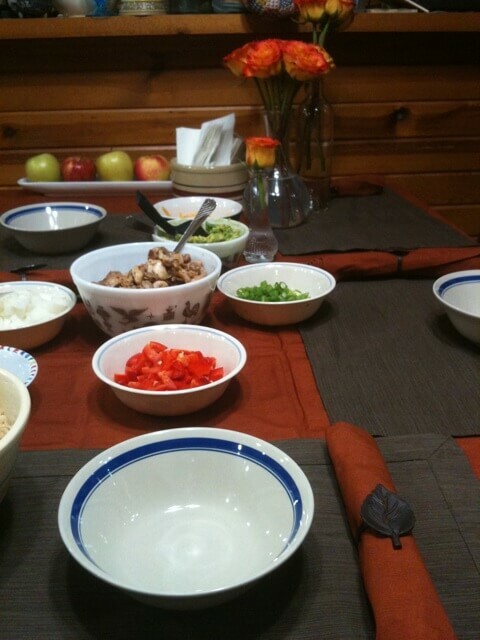 For example last night we made Chicken Fajita Rice Bowls, (shot on my iPhone), so tasty! We have taco night often and I even make a tasty Southwestern Pasta! I also do a lot of Italian cooking, tonight I plan on doing a roasted garlic and butternut squash risotto, hopefully it comes out tasty! So to sum it up, my top three favorite things to cook & eat would be Mexican / Tex-Mex / Italian cuisines! Thank you for asking! I think it’s because those cuisines, for me at least, are VERY quick to prepare. YUM! I miss fajitas and tacos. I could eat them without sour cream and cheese but what is the point??? LMAO! LOL! I don’t think I could go without cheese but sourcream I don’t use much in my mexican food as I prefer avocado/guacamole lol! We love Mexican too, and I totally stole the Southwestern Pasta recipe. It sounds great! LOL thank you! It is seriously nummy! Hi there! I was just checking out yesterday’s post and realized you’ve changed your blog up a bit for Fall. I totally love it. :) So pretty!